According to well-known online security firm Kaspersky, a cyber attack was launched every 40 seconds in 2016. By 2018, that number was up by a third. If that’s what the stats were last year, just imagine how much danger your online privacy is in today. With every major corporation getting hit by a hack attack, from Sony to Adobe, Yahoo, and beyond, we can no longer sit idly by and naively assume that the brands that hold our accounts will keep our information safe (quite the contrary, they’re often the ones exploiting our data the most!). In 2019, it is every man for themselves, and we need to start taking responsibility for our digital privacy. To keep yourself, your personal data, and your devices safe against the devastating effects of malicious attacks, here are 9 tools you need to be using right now. Often, hackers use algorithms to keep trying different passwords until they crack your accounts. The way around this is to use strong passwords that the bots can’t manipulate. Passwords that incorporate special characters (%#* and the like), use a combination of upper and lowercase letters, and numbers, are the hardest for the bots to replicate, so these are the strongest and best ones to use. Using a different password for every account is annoying, but vitally important for online security. After all, if a hacker gets hold of your password, they have access to all of your accounts that share that password. This is where the password manager comes into play. You don’t have to remember all those passwords or even choose unique ones yourself. A good password manager will keep all of your passwords securely stored for you. Finally, never leave your password written on a piece of paper, in an email, or anywhere else people might find it. Password managers can help with this too. There are plenty of great ones including Dashlane, 1Password, and Blur. Apple also has a free password manager on Mojave and iOS 12. The next step in digital protection is using a VPN. Simply put, a virtual private network works like a fortified tunnel, and any information sent through the tunnel is protected against attacks. It’s a basic concept that holds major ramifications for anyone serious about their online privacy. Since nobody can see the information being sent through these channels (even your IP address and location), many people use VPNs for a number of reasons, including online shopping, accessing geo-restricted content, and keeping their private information away from prying eyes. Don’t be lured in by free VPNs, they don’t offer the same level of protection (or service for that matter) as a paid for service. But there are loads of quality options like Panda or Avast that are only a few bucks a month (well worth the price for online security). Plus, good services like Hotspot Shield or PureVPN have extra features like firewalls, double VPN, or DNS leak protection to provide the maximum protection against security breaches while online. Today, a VPN service is cheap, easy to use, and offers invaluable protection, so there’s just no excuse for not using one. Choose from the top VPN services on the market today. Of course, using an encrypted router will just further any security efforts beyond the single device you’re using. If you have a VPN, for example, on your desktop computer, the encrypted router can extend that protection to any device that is connected to your router. It’ll also protect you against snoopers trying to pick up info on you through your ISP. Check out Asus for some top quality VPN-enabled routers. Browsers are major targets for hackers because they contain a ton of private information (think browsing history, passwords, autofill form information, usernames, etc.) and have a lot of chinks in their armor. Some people are already using secure browsers without even knowing it. If you use Firefox, for example, you’ve got privacy and security already built in. You should play with the settings to choose the level of security you want. Alternatively, you can opt for a lesser-known (but more resilient) option like Brave (chromium-based), Waterfox (a branch of Firefox with more simplicity), or Tor browser (based on the TOR network). Whichever you use, this tool is a major digital privacy weapon that will heavily defend you against attacks. DNS, aka domain name system, is the go-between from your web browser to your router. It tells your router where you want to go when you type a URL into the address bar. Most people don’t even know there’s a DNS working behind the scenes, so they certainly aren’t aware that theirs isn’t secure. But now that you know, you can switch your default DNS to a secure one that will encrypt your information. Sign up for a solid service, and they’ll have easy to follow instructions that should only take you a minute to implement. We can’t believe in 2019 this is still being talked about. Antiviruses come free with most OS, but even the paid for versions are competitively priced. Most of all though, an antivirus is a basic security feature that can protect you against millions of potential malware threats, online phishing scams, MIM attacks, and more without you doing a thing. Basically, not having an antivirus today is like going outside in the freezing cold and rain without a jacket. No way you’re not going to catch a bug! 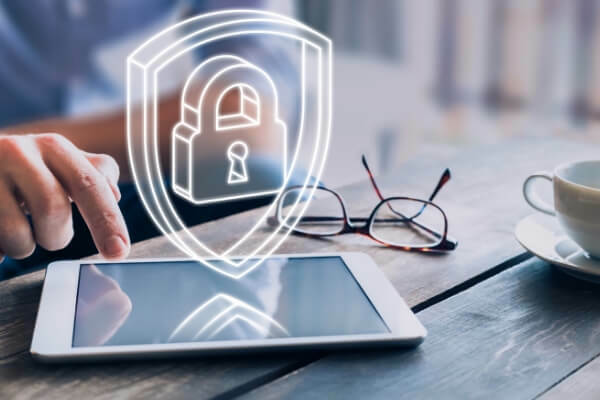 There are plenty of top of the line antiviruses like Kaspersky, Bitdefender, Symantec, and Webroot, so do some comparison shopping and start protecting yourself today. Ads aren’t just annoying, they’re dangerous. Why? Because ads actually track your online activity and help outsiders create a personal profile of you without your knowledge or consent. Ads can also include viruses that you aren’t aware of, installing them on your device behind the scenes. Scariest of all, you don’t even have to click on some ads for them to start attacking your device! So an ad blocker isn’t just convenient, it’s essential. There are browser extensions, apps, and VPN services that will help keep your online activity safe, so choose one that works for you. We’ve covered a lot of the main channels of attack that a cybercriminal can take to get to your data. But what if someone manages to gain access to your computer anyway? Enter the encrypted hard drive. With an encrypted hard drive, even if someone does manage to slip through your defenses, they won’t be able to get to your vital data. Use tools like DiskCryptor (it’s open source and free! ), or FileVault if you have a Mac. From the recent WannaCry ransomware attack to the Ethereum attack that made off with $7.4 million, there are plenty of ways for hackers to destroy a person’s life in minutes. Fortunately, there are also plenty of ways for you to stop them if you choose to. Implement these important digital privacy tools, and stay secure in this volatile digital age.